I'm kind of on an Art Saaf kick lately. When I was a kid or a punk teen, I wouldn't have appreciated his work, because I was into people who rendered the heck out of everything, or put a lot of flash on the page. Sure, I had taste-- I was into Joe Kubert, Gene Colan and Al Williamson, after all. But as I've matured, I've come to love these journeyman old dudes who may not have blown readers away, but could draw anything the writer asked for. Despite Mark Evanier's opinion that "No one drew the female figure in action better than Artie Saaf," Saaf's art is most definitely not spectacular; he wasn't a Neal Adams, a Nestor Redondo, a Jose Luis Garcia-Lopez, or a Nick Cardy. He was a guy who started working when comics were young and put in his time at the drawing board doing everything from capes to war to romance. It's just solid, believable work with well-rendered anatomy and storytelling clarity of a kind mainstream-- superhero-- comics have largely abandoned. There's not a line present that isn't justified, zero visual noise. The vehicles might be faked and the space costumes a bit on the goofy side, but it's got a warmth and appeal to it a lot of today's superficial, super-slick digitally-finished art doesn't with all its photo-real bells and whistles. Saaf's art has become timelessly retro in a way I'm not sure our current crop of superhero scribblers ever will. But that's for tomorrow's nostalgics to decide. 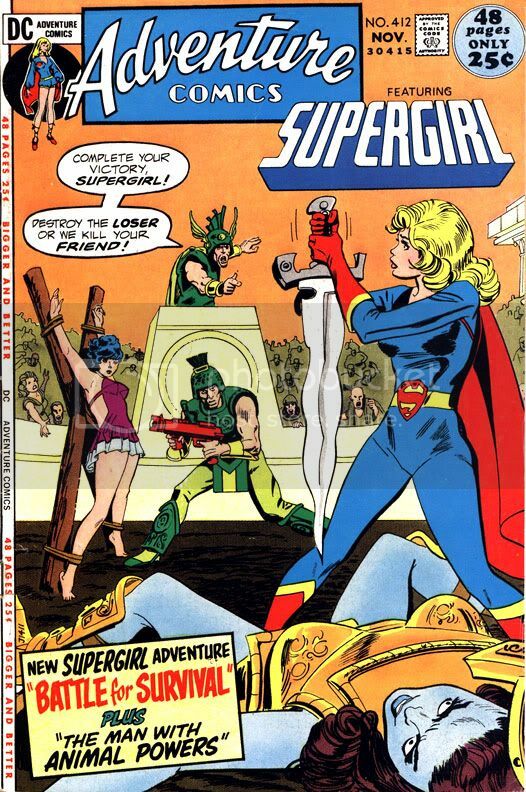 Adventure #412 features Supergirl starring in "The Battle for Survival," with Saaf's pencils inked by Bob Oksner-- who contributed the dramatic and somewhat suggestive cover. It came out in 1971and features a cheerful, positive-minded Supergirl living in San Francisco. As Linda Danvers, Supergirl works for a TV station where her immediate superior, Geoff, is a red-haired guy with the ultra-hip sartorial style and mustache of a low-rent Ron Burgundy-- and who gently sexually harasses her at every opportunity. Supergirl shrugs it off as "corny" humor. I suppose you can't expect more from a guy who wears a polka-dotted ascot. The story, written by John Albano, is nutty in its conception. Someone disguised as Supergirl is committing crimes, and it turns out it's all a mad scheme to find out if Supergirl really is all she's cracked up to be. This is important, because there's a planet with one of the stupidest ways yet conceived of choosing a ruler-- single combat between champions chosen by the various political contenders. 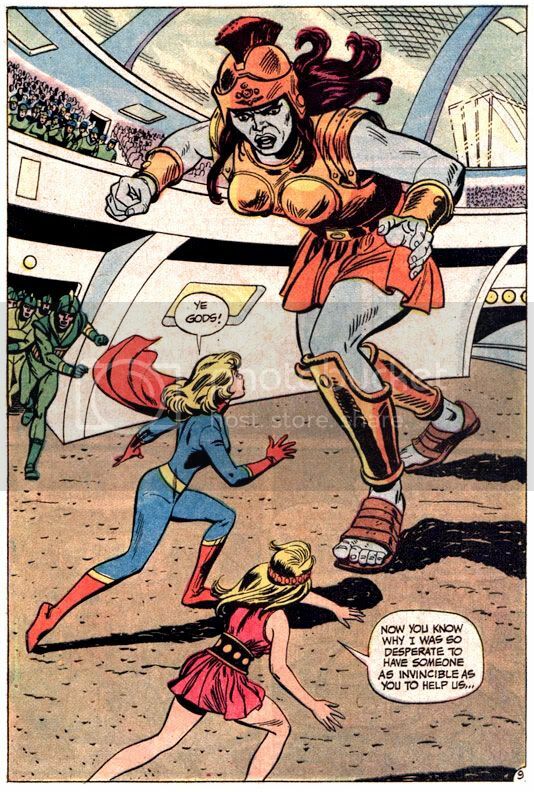 So Glynix, who wants to keep her throne, comes to Earth and causes all sorts of trouble to test Supergirl and blackmail her into fighting as her champion against a blue-skinned giant in orange armor. Why Glynix-- who claims to be in a great hurry-- couldn't have simply asked Supergirl to help her rather than waste a lot of time wreaking havoc isn't addressed. I imagine it has a lot to do with the necessity for DC comics of that era to have a story hook of some kind, and a lot of action. A reasonable request just wouldn't cut it. And we wouldn't get to see Saaf's drawings of Supergirl snuffing explosive capsules with her hands. Whether or not Saaf was the best at depicting women in action is debatable, but he certainly makes a case for himself here. Even the opening splash page with ordinary human being Nasthalthia Luthor (I have to love her because she's only doing this job for her own evil purposes but she works hard at it; there's a character we're going to have to talk about later) tells us this is an artist well within his comfort zone drawing the female body moving, turning, running. Punching space giants and single-handedly defeating armies armed with laser rifles, which are two wonderful things Supergirl does later, before flying all the way back to Earth under her own power, then declaring to herself, "Home at last! And am I bushed!" There aren't any Escher Girls here. Glynix and her people can make capsule explosives powerful enough to flatten cities and laser cannons, but still resort to fighting with the knives they wear on their belts. And the main villain has a pointy goatee and a sun symbol on his tunic, both of which seem to be de rigueur for would-be space tyrants. As you can see, Supergirl wears a modest bodysuit throughout. Glynix, disguised as Supergirl, wears a 1960s Mod minidress, but the real thing goes about covered completely from neck to feet, her Super-logo reduced to a mere belt buckle. It's a boring costume. The one she's wearing in her latest title is more visually appealing. It's not perfect-- I'm not sold on the wrap collar, red diaper-panel or the knee cut-outs in her thigh-high boots, but at least she's not flying around looking like a Britney Spears clone anymore. The only thing I'm not too keen on is the feminine version of Superman's spit curl Saaf sticks Supergirl with. The rest of her hair is in a kind of contemporary flip (kind of like Mary Tyler Moore's at the time, which is fitting given Supergirl's civilian job), but the bangs curl around like a cream horn, making it look like she's wearing a pastry for a toupee.